Photo: Haw Branch Plantation Home, ca. 1748, Route 667, Amelia Court House, VA. Listed on the National Register of Historic Places in 1973. Photographed by User:Goingstuckey (own work), 2007, [cc-by-3.0 (creativecommons.org/licenses/by/3.0)], via Wikimedia Commons, accessed August, 2014. 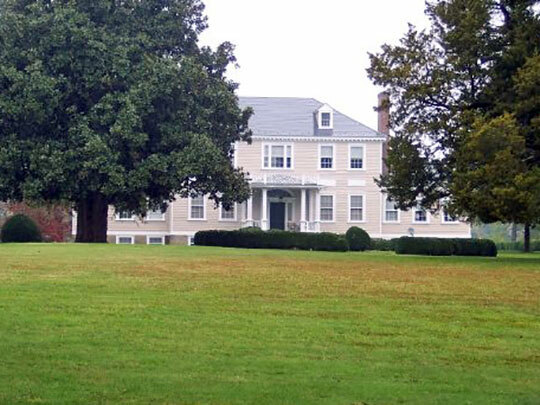 Amelia County administrative offices are located at 16360 Dunn Street, Amelia, VA 23002; phone: 804-561-3039. Amelia County was created by a legislative act in 1734, and was named for Princess Amelia, the youngest daughter of George II of England. The first courthouse was erected shortly after the County was formed, and was located near the settlement of Prideville, now called Truxillo. After the original courthouse was destroyed by fire in 1766, a new site was selected on West Creek near Dennisville, about 5 miles south of the present location in the Amelia Courthouse village. Thirty years later in 1793, this site was abandoned and another courthouse was erected on land obtained from Henry Anderson, near Pincham's Cool Spring, about 300 yards north of the present site. The original portion of the present courthouse was built in 1924 and has been expanded twice in recent years. Amelia County was carved almost entirely out of Prince George County and originally contained what is now Prince Edward and Nottoway Counties. Prince Edward County was created in 1754 and Nottoway County in 1789. Early Settlement of the County. The earliest inhabitants of the area that is now Amelia County are believed to have been Monacan Indians, part of a federation of the Sioux. Bacon's war in 1676 began the midland Indian's downfall, and they gradually moved from the area and the encroaching settlers that continued to arrive during the late 17th and early 18th centuries. One account says that the last tribal Indians had left Amelia by 1730. Amelia was originally settled by early colonial settlers because much of the tidewater land had been exhausted from the growing of tobacco, and many more settlers were continually arriving, thus putting further pressure on all of the tidewater land resources. Since the early colonial settlement, Amelia has traditionally been a tobacco growing County and a mainly agricultural economy throughout its history. It is now a very diversified agricultural industry, including not only the traditional tobacco and wheat, but also cattle, poultry, and other grains and livestock. Mica is an abundant mineral in the County, and mines were successfully worked during the County's early years. Mineral springs had wide notoriety with Amelia Sulfur Springs a resort for all eastern and southside Virginia. Wood and lumber have been a major source of revenue since the civil war and continue to play a very prominent role in the local economy. In the late nineteenth century, the Amelia Courthouse area was described as a "growing village with six stores and a large steam flouring mill ... a tobacco warehouse and factory of immense proportion ... three churches, a grade school. .. a large hotel. ... [and] a private boarding house .... Amelia has as little crime as any of the surrounding counties." In the early years of settlement, the Appomattox River and the major creeks that feed it through Amelia, including the Deep, Flat, and Namozine Creeks, were used as "highways" to move supplies and tobacco. In about 1850, the Richmond and Danville Railroad (later the Southern Railroad Co.) was being built through Amelia County. County Courts were granted extensive powers of local legislation in the colonial period. The Court had authority over assessments, taxes, public buildings and property, relief of orphaned children, jails, hospitals, "ordinances", merchants licenses, wills and real estate transactions, etc. Thus, the Courthouse and its associated activities were central, unifying elements of the County's political, economic and cultural life. Amelia maintained a militia for internal security during revolutionary war. Militiamen served enlistments of four months each, came and went to take care of farms and businesses, and fought "hit and run" engagements while they were active. Compensation for serving in the Continental army was sometimes made with land rather than cash. The County prospered between Revolutionary and Civil Wars. The population increased, homes and mills were built, and the plantation system flourished economically and culturally. The larger early plantations ranged in size from several hundred to a few thousand acres, generally around 1,000 acres. The majority were smaller, however. County of Amelia, Virginia, Revised Comprehensive Plan: 2000-2025, 2001, www.ameliacova.com, accessed August, 2014.